With more than a century of combined heritage, ULA is the world's most experienced and reliable launch service provider. ULA has successfully delivered 131 satellites to orbit that provide Earth observation capabilities, enable global communications, unlock the mysteries of our solar system, and support life-saving technology. "As the nation faces growing threats in the space environment, ULA is unleashing the energy of American ingenuity by developing the Vulcan Centaur," said Bruno. "Purpose built to meet our nation's needs for expanding space missions, the Vulcan Centaur's innovative technology is transforming the future of launch and will advance America's superiority in space." ULA's Atlas and Delta rockets have been the backbone of American space launch for decades. Building on a progressive history of technology development and advancement, the Vulcan Centaur will advance this rich heritage. "Manufacturing of Vulcan Centaur pathfinder and qualification hardware in the factory has been going on for nearly a year and just a few weeks ago, the team began to manufacture the first flight hardware," said Bruno. "It is a tremendously exciting time as we watch the first flight vehicle being built." Panelists from key ULA suppliers including Aerojet Rocketdyne, Blue Origin, Dynetics, L3 Technologies, Northrop Grumman and RUAG discussed their timeline, components, state-of-the-art technology and manufacturing techniques as they move forward building and testing hardware in advance of the Vulcan Centaur's first flight in 2021. "The strong team behind the Vulcan Centaur, including ULA's supplier base, is proud to be building a rocket to launch critical American defense assets. Vulcan Centaur will provide higher performance and greater affordability while also continuing to deliver our unmatched reliability and precision," said Bruno. ULA is the nation's only full-range launch provider and is significantly investing in and modernizing the factory in Decatur, Ala., and upgrading launch facilities to be more capable and flexible. "When designing Vulcan Centaur, we took the best of Atlas and Delta and carried that over to our new rocket," said Bruno. "In addition, many of Vulcan Centaur's major components will be flown first on Atlas V missions such as the solid rocket boosters, avionics, software, upper-stage engine and payload fairings, lowering the risk of the first flight." With more than a century of combined heritage, ULA is the world's most experienced and reliable launch service provider. ULA has successfully delivered 133 satellites to orbit that provide Earth observation capabilities, enable global communications, unlock the mysteries of our solar system and support life-saving technology. 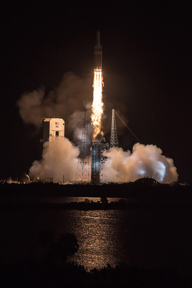 Cape Canaveral Air Force Station, Fla., (March 15, 2019) - A United Launch Alliance (ULA) Delta IV rocket carrying the tenth Wideband Global SATCOM (WGS) satellite for the U.S. Air Force lifted off from Space Launch Complex-37 on March 15 at 8:26 p.m. EDT. ULA has been the exclusive launch provider for all ten WGS satellites. ""We are very proud to deliver this critical asset to orbit in support of the U.S. and Allied warfighters deployed around the world defending our national security," said Gary Wentz, ULA vice president of Government and Commercial Programs. "Thank you to the entire ULA team and mission partners for their outstanding teamwork and dedication to mission success." The WGS-10 satellite, built by the Boeing Company, is an important element of the new high-capacity satellite communications system. Each WGS satellite provides more wideband communications capacity than the entire Defense Satellite Communications System. This mission launched aboard a Delta IV Medium+ (5,4) configuration vehicle, built in Decatur, Alabama, including a 5-meter Payload Fairing and standing at 218 feet. The common booster core for Delta IV was powered by the RS-68A engine, and the Delta Cryogenic Second Stage was powered by the RL10B-2 engine, both supplied by Aerojet Rocketdyne. Northrop Grumman provided the four solid rocket motors. At liftoff, the main engine and four solid rocket motors comined to produce approximately 1.7 million pounds of thrust. To date ULA has a track record of 100 percent mission success with 133 successful launches. Good afternoon - The ULA Launch Readiness Review was completed today and everything is�progressing toward the ULA Delta IV launch carrying the WGS-10 mission for the U.S. Air Force. The mission is set to lift off on Friday, March 15 from Space Launch Complex-37 at Cape Canaveral Air Force Station in Florida. Today's forecast�shows an 80 percent�chance of favorable weather conditions for launch.�The launch window begins at 6:56 p.m. ET and extends to 9:05 p.m. ET. Live broadcast coverage of launch will begin at 6:35 p.m. ET on March 15. The United Launch Alliance Delta IV booster that will launch the 10th Wideband Global SATCOM (WGS) mission for the U.S. Air Force goes vertical at Space Launch Complex-37 at Cape Canaveral Air Force Station, Florida. Good afternoon – Everything is progressing toward the ULA Delta IV launch carrying the WGS-10 mission for the U.S. Air Force. The mission is set to lift off on Friday, March 15 from Space Launch Complex-37 at Cape Canaveral Air Force Station in Florida. Today's forecast shows a 70 percent chance of favorable weather conditions for launch. The launch window begins at 6:56 p.m. ET and extends to 9:05 p.m. ET. 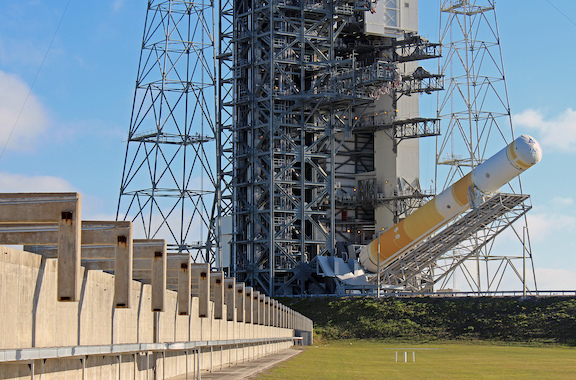 Cape Canaveral Air Force Station, Fla., (March 13, 2019) – A United Launch Alliance (ULA) Delta IV rocket is in final preparations to launch the tenth Wideband Global SATCOM (WGS) satellite for the U.S. Air Force. The launch is planned for March 15 at Space Launch Complex-37 from Cape Canaveral Air Force Station. "ULA is proud to be the exclusive launch provider for all ten WGS missions," said Gary Wentz, ULA vice president of Government and Commercial Programs. "Our focus on mission success continually demonstrates that safely and reliably delivering these critical national assets is our highest priority." The Wideband Global SATCOM (WGS) system, developed by the Boeing Company, provides wideband communications connectivity for U.S. and allied warfighters around the world. This mission will launch aboard a Delta IV Medium+ (5,4) configuration vehicle, which includes a 5-meter Payload Fairing and stands at 218 ft. The common booster core for Delta IV is powered by the RS-68A engine, and the Delta Cryogenic Second Stage is powered by the RL10B-2 engine, both supplied by Aerojet Rocketdyne. Northrop Grumman provided the four solid rocket motors. To date ULA has a track record of 100% mission success with 132 successful launches. Good evening – Everything is progressing toward the ULA Delta IV launch carrying the WGS-10 mission for the U.S. Air Force. The mission is set to lift off on Friday, March 15 from Space Launch Complex-37 at Cape Canaveral Air Force Station in Florida. The launch window begins at 6:56 p.m. ET and extends to 9:05 p.m. ET. 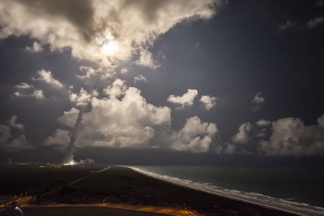 (Cape Canaveral Air Force Station, Fla., March 9, 2019) The launch of a United Launch Alliance Delta IV carrying the Wideband Global SATCOM (WGS-10) mission for the U.S. Air Force has been delayed to allow for additional troubleshooting to resolve some off-nominal data indications. The vehicle and spacecraft remain stable and all systems are nominal and ready to proceed with final processing. The launch is scheduled for Friday, March 15, 2019 at 6:56 p.m. ET. Centennial, Colo. (Jan. 31, 2019) – NASA's Launch Services Program announced today that it selected United Launch Alliance's (ULA's) proven Atlas V vehicle to launch the Lucy mission, which is the first mission to Jupiter's swarm of Trojan asteroids. This award resulted from a competitive Launch Service Task Order evaluation under the NASA Launch Services II contract. "We could not be more pleased that NASA has selected ULA to launch this amazing planetary science mission," said Tory Bruno, ULA's president and chief executive officer. "This mission has a once-in-a-lifetime planetary launch window, and Atlas V's world-leading schedule certainty, coupled with our reliability and performance provided the optimal vehicle for this mission. Our Atlas V rocket has launched 79 times achieving 100 percent mission success, and we look forward to working again with our mission partners to explore our universe." Jupiter's swarms of Trojan asteroids may be remnants of the primordial material that formed the outer planets, and serve as time capsules from the birth of our solar system more than 4 billion years ago. Lucy will be the first space mission to study the Trojans. The mission takes its name from the fossilized human ancestor (named "Lucy" by her discoverers) whose skeleton provided unique insight into humanity's evolution. Lucy will complete a 12-year journey to seven different asteroids. With more than a century of combined heritage, ULA is the world's most experienced and reliable launch service provider. ULA has successfully delivered 132 missions to orbit that provide Earth observation capabilities, enable global communications, unlock the mysteries of our solar system, and support life-saving technology. Huntsville, Ala., Jan. 25, 2019 – "United Launch Alliance welcomes Blue Origin to the great state of Alabama and to join the other aerospace companies that have made Rocket City our home for decades. A little more than three months ago, ULA chose Blue Origin's BE-4 engine to power our Vulcan Centaur rocket, which we are manufacturing at our facility in Decatur, Alabama. I am pleased that Blue Origin has chosen to join the more than 200 ULA suppliers doing business here in Alabama. The state of Alabama knows how to attract and help business grow and I could not be more thrilled to be part of the resurgence of rocket and engine development in the Tennessee Valley. "ULA's Atlas and Delta rockets are the most successful space launch vehicles in history, having launched more than 130 missions with 100 percent mission success. Today, we celebrate the culmination of those decades of knowhow and invention into the transition to our new Vulcan Centaur rocket. Vulcan Centaur is one system for all missions. It will embody our expertise and reliability while providing advanced technology to our warfighters, being superior in both cost and capability. Vulcan Centaur is the only launch vehicle with a design that is centered on our customers' national security space mission. Vulcan Centaur will provide for our nation's needs today and into the future. We look forward to our partnership with Blue Origin, building the advanced BE-4 engine to power our next-generation rocket, right here in Alabama!" The Mobile Service Tower rolls back from the United Launch Alliance (ULA) Delta IV Heavy rocket carrying NRO's NROL-71 mission in preparation for launch from Space Launch Complex-6 at Vandenberg Air Force Base, California. Vandenberg Air Force Base,�Calif., (Jan. 19, 2019)�-- A United Launch Alliance (ULA) Delta IV Heavy rocket carrying a critical payload for the National Reconnaissance Office (NRO) denoted NROL-71 lifted off from Space Launch Complex-6 on Jan. 19 at 11:10 a.m. PST. The mission is in support of our country's national defense. "Congratulations to our team and mission partners for successfully delivering this critical asset to support national security missions," said Gary Wentz, ULA vice president of Government and Commercial Programs, "thank you to the entire team for their perseverance, ongoing dedication and focus on 100% mission success." The Delta IV Heavy is the nation's proven heavy lift launch vehicle, delivering high-priority missions for the National Reconnaissance Office, U.S. Air Force and NASA. With its advanced upper stage, the Delta IV Heavy can take more than 14,000 pounds directly to geosynchronous orbit, as well as a wide variety of complex interplanetary trajectories. NROL-71 is ULA's first launch in 2019 and 132nd successful launch since the company was formed in December 2006. 1/18/19 -- Everything is progressing toward the ULA Delta IV Heavy launch carrying the NROL-71 mission for the National Reconnaissance Office. The mission is set to lift off on a Delta IV Heavy rocket on Saturday, Jan. 19 from Space Launch Complex-6 at Vandenberg Air Force Base in California. The launch time is 11:05 a.m. PST. Live�broadcast coverage of launch�will begin at 10:45 a.m. PST on Jan.19. (Vandenberg Air Force Base, Calif. Jan. 15, 2019) � The United Launch Alliance Delta IV Heavy carrying the NROL-71 mission has been scheduled for Saturday, Jan. 19 from Space Launch Complex-6 at Vandenberg Air Force Base in California at 11:05 a.m. PST. (Vandenberg Air Force Base, Calif. Jan. 5, 2019) � The United Launch Alliance Delta IV Heavy carrying the NROL-71 mission launch date is under review. A new launch date and time will be provided pending the results of additional testing. "We continue to remedy the technical issues that caused the last scrub of the Delta IV Heavy, and are working with our partners, the National Reconnaissance Office and the U.S. Air Force, to ensure that we fly when it is safe to do so," said Gary Wentz, vice president of Government and Commercial programs, "we understand that this is a high-priority mission for the nation's warfighters and we take our commitment to safety and mission assurance seriously." (Vandenberg Air Force Base, Calif. Dec. 28, 2018) -- The United Launch Alliance Delta IV Heavy carrying the NROL-71 mission will launch no earlier than Sunday, Jan. 6, 2019. The mission will launch from Space Launch Complex-6 at Vandenberg Air Force Base in California. � (Vandenberg Air Force Base, Calif., Dec. 20, 2018) -- The launch of a United Launch Alliance Delta IV Heavy carrying the NROL-71 mission for the National Reconnaissance Office was scrubbed yesterday due to indications of elevated hydrogen concentrations within the port booster engine section. The team is currently reviewing all data and has set the next launch attempt no earlier than Dec. 30, 2018. (Vandenberg Air Force Base, Calif., Dec. 19, 2018) -- The launch of a United Launch Alliance Delta IV Heavy carrying the NROL-71 mission for the National Reconnaissance Office was scrubbed today due to indications of elevated hydrogen concentrations within the port booster engine section. The team is prepping for a 24-hour turn around on Thursday, Dec. 20, from Space Launch Complex-6 at Vandenberg Air Force Base. The forecast shows a 80 percent chance of favorable weather conditions for launch. The launch is planned for 5:31 p.m. PST. Everything continues to progress towards the ULA Delta IV Heavy launch carrying the NROL-71 mission for the National Reconnaissance Office for lift off on Wednesday, Dec. 19 from Space Launch Complex-6 at Vandenberg Air Force Base in California. The forecast is for a 80 percent chance of favorable weather conditions for launch. The launch time is 5:44 p.m. PST. (Vandenberg Air Force Base, Calif., Dec. 18, 2018) – The launch of a United Launch Alliance Delta IV Heavy carrying the NROL-71 payload for the National Reconnaissance Office was scrubbed today due to high ground winds. The next launch attempt is planned for Wed., Dec. 19, from Space Launch Complex-6 at Vandenberg Air Force Base, Calif. The forecast indicates an 80 percent chance of favorable weather conditions for launch. The targeted launch time is 5:44 p.m. PST. Everything continues to progress towards the ULA Delta IV Heavy launch carrying the NROL-71 mission for the National Reconnaissance Office. The mission is set to lift off on a Delta IV Heavy rocket on Tuesday, Dec. 18 from Space Launch Complex-6 at Vandenberg Air Force Base in California. The forecast remains a 20 percent chance of favorable weather conditions for launch. The launch time is 5:57 p.m. PST. Live�broadcast coverage of launch�will begin at 5:37 p.m. PST on Dec. 18. Everything is progressing toward the ULA Delta IV Heavy launch carrying the NROL-71 mission for the National Reconnaissance Office. The mission is set to lift off on a Delta IV Heavy rocket on Tuesday, Dec. 18 from Space Launch Complex-6 at Vandenberg Air Force Base in California. Today's forecast remains a 20 percent chance of favorable weather conditions for launch. The launch time is 5:57 p.m. PST. Everything is progressing toward the ULA Delta IV Heavy launch carrying the NROL-71 mission for the National Reconnaissance Office. The mission is set to lift off on a Delta IV Heavy rocket on Tuesday, Dec. 18 from Space Launch Complex-6 at Vandenberg Air Force Base in California. Today's forecast shows a 20 percent chance of favorable weather conditions for launch. The launch time is 5:57 p.m. PST (8:59pm EST). Live launch updates and Webcast available at�www.ulalaunch.com�and�www.youtube.com/unitedlaunchalliance . Everything is progressing toward the ULA Delta IV Heavy launch carrying the NROL-71 mission for the National Reconnaissance Office. The mission is set to lift off on a Delta IV Heavy rocket on Tuesday, Dec. 18 from Space Launch Complex-6 at Vandenberg Air Force Base in California. The launch time is 5:57 p.m. PST. Centennial, Colo. (Dec.13, 2018) – United Launch Alliance (ULA) has issued its request for student teams from kindergarten through 12th grade to create "payloads" for the 2019 ULA and Ball Aerospace Student Rocket Launch. More than 20 K-12 student teams will have a chance to design, build and launch objects, experiments or instruments on the ULA-intern-built Future Heavy Super Sport rocket next summer. Teams can choose to compete for a chance to win up to $5,000 for their school or sponsoring nonprofit organization by guiding their payload closest to a designated ground-based target. The Student Rocket Launch program offers students from kindergarten through graduate school hands-on experience working with rockets and payloads. ULA intern volunteers design, build and refurbish the high-power sport rocket – dubbed "Future Heavy Super Sport" – while volunteer interns from Ball Aerospace and K-12 students design and build payloads that launch on the rocket. Teams can download the request for proposal at https://www.ulalaunch.com/explore/intern-rockets. Interested teams should notify the ULA contact noted in the RFP of their interest as soon as possible; the deadline to submit proposals is Jan. 31, 2019. "At United Launch Alliance, the work we do every day saves lives, enables exploration and connects the world, and these students are the future of our industry," said Tory Bruno, ULA president and CEO. "The Student Rocket Launch is a chance to experience what it's like to be a part of a rocket launch and mission. These students dream big, solve problems, build hardware, watch their payloads blast off on a rocket and then evaluate the results." Payloads are objects, experiments or instruments launched on and deployed (if desired) from the rocket. A payload can be almost anything a team can create within the provided guidelines. Past payloads have included everything from a class teddy bear dressed as an astronaut to drones programmed to land at a predetermined location. There is no cost to the students or schools to fly payloads on the Future Heavy rocket, though they are responsible for the cost of materials, travel, etc. The payloads will launch on the ULA intern-built Future Heavy Super Sport, a 35-foot-tall high-power sport rocket. It will fly to approximately 5,000 feet above the ground, where it will release 27 payloads. Thirteen payloads can compete for the cash prizes and will need to meet special competition requirements; the other payloads will be reserved for teams who want to fly payloads but not compete for the prize. The Student Rocket Launch gives students and interns design, analysis, test and hands-on fabrication experience in order to encourage participants to pursue technical careers that will be the future of our nation's presence and security in space. Ball Aerospace pioneers discoveries that enable our customers to perform beyond expectation and protect what matters most.� We create innovative space solutions, enable more accurate weather forecasts, drive insightful observations of our planet, deliver actionable data and intelligence, and ensure those who defend our freedom go forward bravely and return home safely. For more information, visit www.ball.com/aerospace or connect with us on Facebook or Twitter. (Vandenberg Air Force Base, Calif., Dec. 13, 2018)– A United Launch Alliance Delta IV Heavy carrying the NROL-71 mission for the National Reconnaissance Office is set to launch on Tuesday, Dec. 18. The mission will lift off on a Delta IV Heavy launch vehicle from Space Launch Complex-6 at Vandenberg Air Force Base in California. The launch time is 5:57 p.m. PST. (Vandenberg Air Force Base, Calif., Dec. 8, 2018) – The launch of a United Launch Alliance Delta IV Heavy carrying the NROL-71 mission for the National Reconnaissance Office was scrubbed today due to an unexpected condition during terminal count at approximately 7.5 seconds before liftoff. The team is currently reviewing all data and will determine the path forward. A new launch date will be provided when available. (Vandenberg Air Force Base, Calif., Dec. 7, 2018) – The launch of a United Launch Alliance Delta IV Heavy carrying the NROL-71 mission for the National Reconnaissance Office was scrubbed today due to an issue with a redundant communication link between the control center and the launch site. The team is prepping for a 24-hour turn around on Saturday, Dec. 8, from Space Launch Complex-6 at Vandenberg Air Force Base. The forecast shows a 60 percent chance of favorable weather conditions for launch. The launch time is 8:06 p.m. PT. 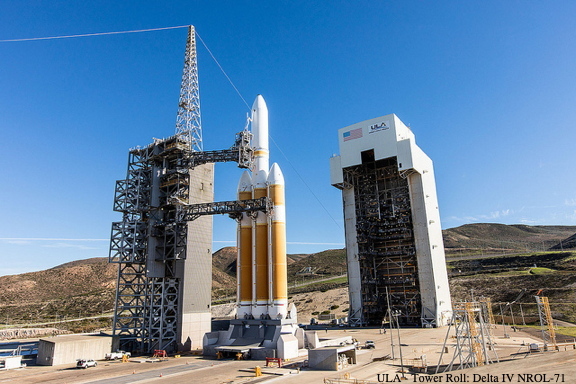 Good evening - The ULA Launch Readiness Review was completed today and everything is progressing toward the ULA Delta IV Heavy launch carrying the NROL-71 mission for the National Reconnaissance Office. The mission is set to lift off on a Delta IV Heavy rocket on Friday, Dec. 7 from Space Launch Complex-6 at Vandenberg Air Force Base in California. Today's forecast shows a 40 percent chance of favorable weather conditions for launch.�The launch time is 8:19 p.m. PT. Live�broadcast coverage of launch�will begin at 7:59 p.m. PT on Dec. 7. Good evening - everything is progressing toward the ULA Delta IV Heavy launch carrying the NROL-71 mission for the National Reconnaissance Office. The mission is set to lift off on a Delta IV Heavy rocket on Friday, Dec. 7 from Space Launch Complex-6 at Vandenberg Air Force Base in California. Today's forecast shows a 40 percent chance of favorable weather conditions for launch.�The launch time is 8:19 p.m. PT. Vandenberg Air Force Base,�Calif., (Dec. 5, 2018)�– A United Launch Alliance (ULA) Delta IV Heavy rocket carrying a payload for the National Reconnaissance Office (NRO) will lift-off from Space Launch Complex-6 on Dec. 7 at 8:19 p.m. PT. Designated NROL-71, the mission is in support of national defense. The Delta IV Heavy is the nation's proven heavy lifter, delivering high-priority missions for the National Reconnaissance Office, U.S. Air Force and NASA. With its advanced upper stage, the Delta IV Heavy can take more than 14,000 pounds directly to geosynchronous orbit, as well as a wide variety of complex interplanetary trajectories. Good afternoon - everything is progressing toward the ULA Delta IV Heavy launch carrying the NROL-71 mission for the National Reconnaissance Office. The mission is set to lift off on a Delta IV Heavy rocket on Friday, Dec. 7 from Space Launch Complex-6 at Vandenberg Air Force Base in California. The launch time is 8:19 p.m. PT. 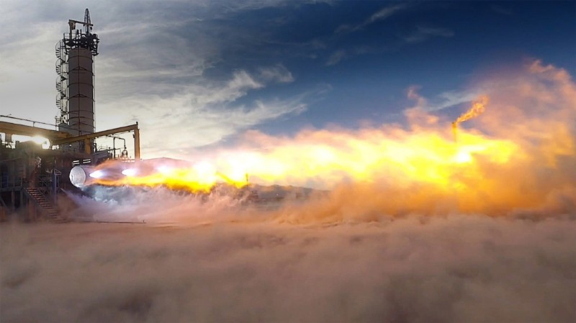 What: ULA's Vice President of Major Development Mark Peller will provide an update on the progress of the Vulcan Centaur, ULA's next-generation launch vehicle, and take media on a tour to see initial pathfinder and qualification hardware manufactured in the factory. ULA is transforming the future of space launch, making it more affordable, accessible and commercialized. The Vulcan Centaur is ULA's next-generation rocket and provides affordability with higher performance, while continuing to deliver on ULA's unparalleled reliability and precision. Where: 1001 Red Hat Road, Decatur, AL. Cape Canaveral Air Force Station, Fla., (Oct. 17, 2018) – A United Launch Alliance (ULA) Atlas V rocket carrying the fourth Advanced Extremely High Frequency (AEHF) mission for the U.S. Air Force lifted off from Space Launch Complex-41 on Oct. 17 at 12:15 a.m. EDT. The launch of AEHF-4 marks ULA's 50th launch for the U.S. Air Force; ULA's first Air Force mission was Space Test Program-1 (STP-1), launched March 8, 2007. (Cape Canaveral Air Force Station, Fla., Oct. 17, 2018) A ULA Atlas V rocket carrying the AEHF-4 mission for the U.S. Air Force lifts off from Space Launch Complex-41 at 12:15 a.m. ET. "ULA's unparalleled record of successfully launching and placing payloads in orbit signifies our profound commitment to national defense," said Tory Bruno, ULA president and CEO. "We remain the only launch provider capable of placing our customers' payloads into any national security space orbit, anytime, which we've proudly exhibited through 50 launches for the U.S. Air Force." "Over the past 12 years, the men and women of ULA have reliably delivered dozens of Air Force payloads into orbit from GPS to WGS, and SBIRS to AEHF," said Gen. Jay Raymond, commander of Air Force Space Command. "ULA's unprecedented 100 percent launch success has directly contributed to our national security. Congratulations to the entire launch team on a successful 50th launch for the U.S. Air Force." This mission launched aboard an Atlas V Evolved Expendable Launch Vehicle (EELV) 551 configuration vehicle, which includes a 5-meter large Payload Fairing (PLF) and stands at 197 ft. tall. Producing more than two and a half million pounds of thrust at liftoff, the Atlas V 551 configuration rocket is the most powerful in the Atlas V fleet. The 551 rocket has launched groundbreaking missions for our nation�from the critically important Mobile User Objective System (MUOS) constellation to historic science missions including New Horizons, the first mission to Pluto, and the Juno mission to Jupiter. The AEHF system, developed by Lockheed Martin, provides vastly improved global, survivable, protected communications capabilities for strategic command and tactical warfighters. "Today's launch exemplifies ULA's ongoing commitment to 100 percent mission success," said Gary Wentz, ULA vice president of Government and Commercial Programs." My sincere thanks to the entire ULA team and our mission partners who made this, our 50th launch for the U.S. Air Force, possible." AEHF-4 is ULA's eighth launch in 2018 and 131st successful launch since the company was formed in December 2006. 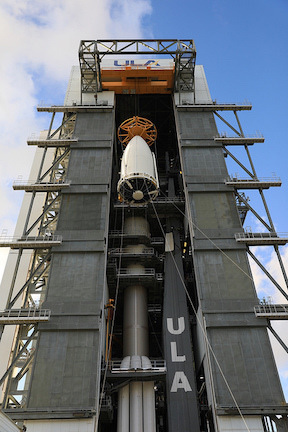 ULA's next launch is the NROL-71 mission for the National Reconnaisance Office on a Delta IV Heavy rocket. The launch is scheduled for Nov. 29 from Space Launch Complex-6 at Vandenberg Air Force Base, California. With more than a century of combined heritage, ULA is the world's most experienced and reliable launch service provider. ULA has successfully delivered more than 130 satellites to orbit that provide Earth observation capabilities, enable global communications, unlock the mysteries of our solar system, and support life-saving technology. Everything is progressing toward the ULA Atlas V launch carrying the AEHF-4 mission for the U.S. Air Force. The mission is set to lift off on Wednesday, Oct. 17 from Space Launch Complex-41 at Cape Canaveral Air Force Station in Florida. Today's forecast�shows an 80 percent�chance of favorable weather conditions for launch. The two hour launch window begins at 12:15 a.m. ET. for the U.S. Air Force stands poised for launch. Photo courtesy of ULA. (Cape Canaveral Air Force Station, Fla., Oct. 15, 2018)�A ULA�Atlas V rocket carrying the AEHF-4 mission for the U.S. Air Force is rolled from the Vertical Integration Facility to the launch pad at Cape Canaveral's Space Launch Complex-41. The ULA Launch Readiness Review was completed yesterday and everything is progressing toward the ULA Atlas V launch carrying the AEHF-4 mission for the U.S. Air Force. The mission is set to lift off on Wednesday, Oct. 17 from Space Launch Complex-41 at Cape Canaveral Air Force Station in Florida. 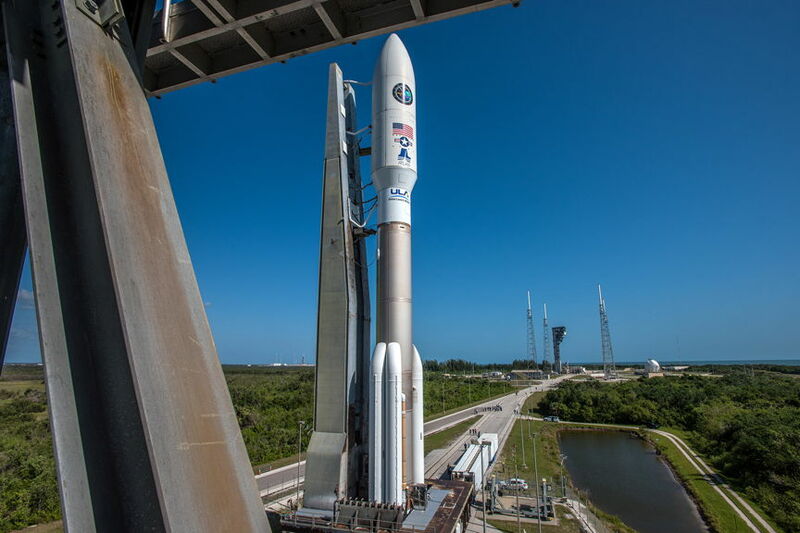 Today's forecast�shows an 80 percent�chance of favorable weather conditions for launch. The two hour launch window begins at 12:15 a.m. ET. Live�broadcast coverage of launch�will begin at 11:55 p.m. ET on Oct.�16. The Air Force's AEHF-4 mission, encapsulated inside a 5-meter payload fairing, is mated to its United Launch Alliance (ULA) Atlas V booster inside the Vertical Integration Facility (VIF) at Cape Canaveral's Space Launch Complex-41. Cape Canaveral Air Force Station, Fla., (Oct. 12, 2018) -- A United Launch Alliance (ULA) Atlas V rocket is in final preparations to launch the fourth Advanced Extremely High Frequency (AEHF) communications satellite for the U.S. Air Force. The launch is planned for Oct. 17 at Space Launch Complex-41 from Cape Canaveral Air Force Station. The two-hour launch window opens at 12:15 a.m. EDT, and the live launch broadcast will begin Oct. 16 at 11:55 p.m. EDT at www.ulalaunch.com. Producing more than two and a half million pounds of thrust at liftoff, the Atlas V 551 configuration rocket is the most powerful in the Atlas V fleet. The 551 rocket has launched groundbreaking missions for our nation�from the critically important Mobile User Objective System (MUOS) constellation to historic science missions including New Horizons, the first mission to Pluto, and the Juno mission to Jupiter. The Atlas V 551 configuration first launched on Jan. 19, 2006, and has launched eight times to date. "ULA continues to serve as our nation's most dependable and successful launch provider," said Gary Wentz, ULA vice president of Government and Commercial Programs. "We are proud to launch this critical satellite for the U.S. Air Force, and demonstrate our strong support of our nation's national defense and the warfighter community." This mission will launch aboard an Atlas V 551 configuration vehicle, which includes a 5-meter large Payload Fairing (PLF) and stands 197 ft. tall. The Atlas booster for this mission is powered by the RD AMROSS RD-180 engine. Aerojet Rocketdyne provided the five AJ-60A solid rocket boosters (SRBs) and RL10C-1 engine for the Centaur upper stage. To date ULA has a track record of 100% mission success with 130 successful launches. With more than a century of combined heritage, United Launch Alliance is the nation's most experienced and reliable launch service provider. ULA has successfully delivered 130 satellites to orbit that aid meteorologists in tracking severe weather, unlock the mysteries of our solar system, provide critical capabilities for troops in the field and enable personal device-based GPS navigation. Centennial, Colo., Sept. 27, 2018 �‒ United Launch Alliance's (ULA) next-generation rocket - the Vulcan Centaur - is making strong progress in development and is on track for its initial flight in mid-2020. The Vulcan Centaur rocket design leverages the proven success of the Delta IV and Atlas V launch vehicles while introducing advanced technologies and innovative features. "Vulcan Centaur will revolutionize spaceflight and provide affordable, reliable access to space for our current and future customers," said Tory Bruno, ULA's president and CEO.�"We are well on our way to the introduction of Vulcan Centaur ‒ the future of U.S. rocket manufacturing. With state-of-the-art engineering and manufacturing techniques, this rocket is designed specifically for low recurring cost." � The new rocket design is nearing completion, and the booster preliminary design and critical design reviews have been completed. Vulcan Centaur will have a maximum liftoff thrust of 3.8 million pounds and carry 56,000 pounds to low Earth orbit, 33,000 pounds to a geo-transfer orbit and 16,000 pounds to geostationary orbit with greater capability than any currently available single-core launch vehicle. "Our new rocket will be superior in reliability, cost and capability ‒ one system for all missions," said Bruno. "We have been working closely with the U.S. Air Force, and our certification plan is in place." Following completion of a competitive procurement, ULA has selected Blue Origin's BE-4 engine for Vulcan Centaur's booster stage. The liquefied natural gas (LNG) fueled booster will be powered by a pair of BE-4 engines, each producing 550,000 pounds of sea level thrust.� As previously announced, ULA has selected Aerojet Rocketdyne's RL10 engine for the Centaur upper stage, Northrop Grumman solid rocket boosters, L-3 Avionics Systems avionics, and RUAG's payload fairings and composite structures for the new Vulcan Centaur rocket system. "We are pleased to enter into this partnership with Blue Origin and look forward to a successful first flight of our next-generation launch vehicle," said Bruno. "We are very glad to have our BE-4 engine selected by United Launch Alliance. United Launch Alliance is the premier launch service provider for national security missions, and we're thrilled to be part of their team and that mission," said Blue Origin CEO Bob Smith. "We can't thank Tory Bruno and the entire United Launch Alliance team enough for entrusting our engine to powering the Vulcan rocket's first stage." Vulcan Centaur will bolster U.S. manufacturing by adding to the more than 22,000 direct and indirect American jobs in 46 states supported by ULA programs. "ULA has chosen the best systems available to create the Vulcan Centaur," said Bruno. "These engines and components will ensure ULA continues to lead the way in space exploration, maintain our record of success and remain America's launch vehicle for our nation's most vital missions." Vulcan Centaur is ULA's next-generation, American rocket system. As a result of these agreements, the Vulcan Centaur will surpass current rocket capabilities and launch services at significantly lower costs, while still meeting the requirements of ULA's cooperative research and development agreement with the U.S. Air Force to certify the Vulcan Centaur for national security space missions. "Strong partners are critical to the cutting-edge innovation that is leading us into the next generation in space and ensuring mission success," said Bruno. "Partnerships with Blue Origin, Aerojet Rocketdyne, Northrop Grumman, L-3 Avionics Systems and RUAG will allow the Vulcan Centaur to transform the future of space launch for the government and commercial markets, making launch more affordable, accessible and commercially available." With more than a century of combined heritage, ULA is the world's most experienced and reliable launch service provider. ULA has successfully delivered 130 satellites to orbit that provide Earth observation capabilities, enable global communications, unlock the mysteries of our solar system, and support life-saving technology. We have some exciting news to share with you! Blue Origin's BE-4 engine has been selected by United Launch Alliance to power the Vulcan rocket. See the statement below from our CEO, Bob Smith, regarding today's announcement. "Today is a great day for the Blue Origin team. We are very honored that United Launch Alliance has selected Blue Origin's LOX/LNG BE-4 as the engine that will power the first stage of their Vulcan rocket. United Launch Alliance is the premier launch service provider for national security missions, and we're thrilled to be part of their team and that mission. We can't thank Tory Bruno and the entire United Launch Alliance team enough for entrusting our engine to power Vulcan. The Blue team is looking forward to developing our production facility for our BE-4 engine in Huntsville over the next year." If you want to learn more about today's announcement, here is Blue Origin's tweet,�ULA's press release, and footage of the BE-4. Centennial, Colo., Sept. 27, 2018 �– United Launch Alliance's (ULA) next-generation rocket - the Vulcan Centaur - is making strong progress in development and is on track for its initial flight in mid-2020. The Vulcan Centaur rocket design leverages the proven success of the Delta IV and Atlas V launch vehicles while introducing advanced technologies and innovative features. "Vulcan Centaur will revolutionize spaceflight and provide affordable, reliable access to space for our current and future customers," said Tory Bruno, ULA's president and CEO.�"We are well on our way to the introduction of Vulcan Centaur – the future of U.S. rocket manufacturing. With state-of-the-art engineering and manufacturing techniques, this rocket is designed specifically for low recurring cost." The new rocket design is nearing completion, and the booster preliminary design and critical design reviews have been completed. Vulcan Centaur will have a maximum liftoff thrust of 3.8 million pounds and carry 56,000 pounds to low Earth orbit, 33,000 pounds to a geo-transfer orbit and 16,000 pounds to geostationary orbit with greater capability than any currently available single-core launch vehicle. "Our new rocket will be superior in reliability, cost and capability – one system for all missions," said Bruno. "We have been working closely with the U.S. Air Force, and our certification plan is in place." Following completion of a competitive procurement, ULA has selected Blue Origin's BE-4 engine for Vulcan Centaur's booster stage. The liquefied natural gas (LNG) fueled booster will be powered by a pair of BE-4 engines, each producing 550,000 pounds of sea level thrust.� As previously announced, ULA has selected Aerojet Rocketdyne's RL10 engine for the Centaur upper stage, Northrop Grumman solid rocket boosters, L?3 Avionics Systems avionics, and RUAG's payload fairings and composite structures for the new Vulcan Centaur rocket system. � Centennial, Colo., Sept. 15, 2018 – United Launch Alliance (ULA) announced today that the last Delta II rocket will join a lineup of historic rockets in the Rocket Garden on display at NASA's Kennedy Space Center Visitor Complex in Cape Canaveral, Fla.
"The Delta II rocket has been a venerable workhorse for NASA and civilian scientists, the U.S. military, and commercial clients throughout its almost 30 years of service," said Tory Bruno, ULA president and CEO.� "This program comes to a close with the final launch of NASA's ICESat-2, but its legacy will continue and the Visitor Complex will help us keep the story of the success of this much-revered rocket in the hearts and minds of the public." The maiden Delta II took flight on Valentine's Day in 1989, successfully delivering the first operational GPS satellite into space. Since that first launch, Delta II rockets have launched 154 successful missions. Its resume includes several trips to Mars as well as the planet-hunting Kepler, the twin lunar-orbiting GRAIL spacecraft, 48 GPS satellites and numerous commercial imaging and communications satellites. The end of an era for the industry workhorse. View photos of the Delta II rocket launching here. 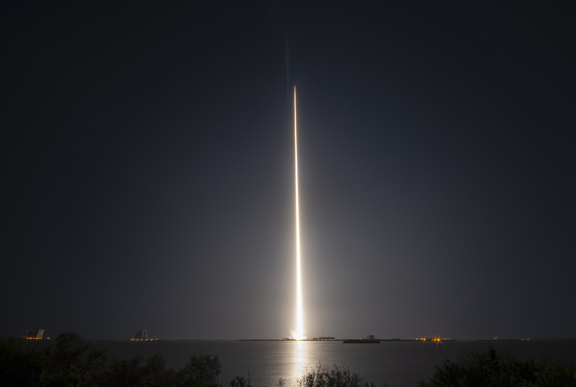 Vandenberg Air Force Base,�Calif., (Sept. 15, 2018)�– A United Launch Alliance (ULA) Delta II rocket carrying NASA's Ice, Cloud and land Elevation Satellite-2 (ICESat-2) spacecraft lifted off from Space Launch Complex-2 on Sept. 15 at 6:02 a.m. PDT. This marks the final mission of the Delta II rocket, which first launched on Feb. 14, 1989, and launched 155 times including ICESat-2. From its origin as the launch vehicle for the first Global Positioning System (GPS) satellites to NASA's Earth observing, science and interplanetary satellites – including Mars rovers Spirit and Opportunity – to vital commercial communication and imaging satellites, the Delta II rocket has truly earned its place in space history. "ULA is proud that the Delta II rocket has been a significant piece of history, launching more than 50 missions for NASA," said Gary Wentz, ULA vice president of Government and Commercial Programs. "I sincerely thank the entire ULA team, NASA, U.S. Air Force, and all of our partners and suppliers who have worked diligently to launch the final Delta II rocket, as well as the dedication of the teams throughout the past 29 years of the program." ICESat-2 will provide scientists with height measurements to create a global portrait of Earth's third dimension, gathering data that can precisely track changes of terrain including glaciers, sea ice, forests and more. Northrop Grumman built the spacecraft. In addition to ICESat-2, this mission included four CubeSats which launched from dispensers mounted to the Delta II second stage. This is ULA's seventh launch in 2018 and the 130th successful launch since the company was formed in December 2006. ULA's next launch is the AEHF-4 mission for the U.S. Air Force on an Atlas V rocket from Space Launch Complex-41 at Cape Canaveral Air Force Station, Florida. Vandenberg Air Force Base, Calif. -- A ULA Delta II rocket carrying NASA's ICESat-2 spacecraft stands poised for launch. Photos courtesy of ULA. View photos of the Delta II rocket on the launch pad here. Good afternoon -�The ULA and NASA Launch Readiness Review was completed today and�everything is progressing toward the ULA Delta II ICESat-2 mission for NASA. The mission is set to lift off on a Delta II rocket on Saturday, Sept.15 from Space Launch Complex-2 at�Vandenberg Air Force Base in California.�Today's forecast shows a 100 percent chance of favorable weather conditions for launch.�The 40-minute launch window begins at 5:46 a.m. PT. Live�broadcast coverage of launch�will begin at 5:10 a.m. PT on Sept.�15. Good evening - everything is progressing toward the ULA Delta II ICESat-2 mission for NASA. The mission is set to lift off on a Delta II rocket on Saturday, Sept.15 from Space Launch Complex-2 at�Vandenberg Air Force Base in California.�Today's forecast shows a 100 percent chance of favorable weather conditions for launch. The 40-minute launch window begins at 5:46 a.m. PT. Vandenberg Air Force Base,�Calif., (Sept. 12, 2018)�– A United Launch Alliance (ULA) Delta II rocket is in final preparations to launch NASA's Ice, Cloud and land Elevation Satellite-2 (ICESat-2) spacecraft from Space Launch Complex-2 on Sept. 15. This marks the final launch of the Delta II rocket, which first launched on Feb. 14, 1989. "This is the end of an era, as we prepare to launch the final Delta II rocket," said Gary Wentz, ULA vice president of Government and Commercial Programs. "This vehicle has truly created a legacy throughout its history launching NASA, critical U.S. military satellites and commercial clients." 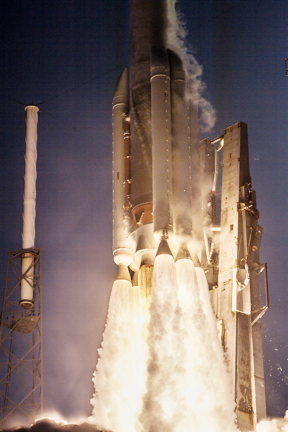 From its origin as the launch vehicle for the first Global Positioning System (GPS) satellites to NASA's Earth observing, science and interplanetary satellites – including Mars rovers Spirit and Opportunity – to vital commercial communication and imaging satellites, the Delta II rocket has justly earned its place in space history. ICESat-2, with its single instrument, the Advanced Topographic Laser Altimeter System (ATLAS), will provide scientists with height measurements to create a global portrait of Earth's third dimension, gathering data that can precisely track changes of terrain including glaciers, sea ice, forests and more. Northrop Grumman built the spacecraft. In addition to ICESat-2, this mission includes four CubeSats which will launch from dispensers mounted to the Delta II second stage. This mission will launch aboard a Delta II 7420-10 configuration rocket, which includes a 10-foot-diameter payload fairing (PLF). The booster for this mission is powered by the RS-27A engine and the second stage is powered by the AJ10-118K engine. To date ULA has a track record of 100% mission success with 129 successful launches. With more than a century of combined heritage, United Launch Alliance is the nation's most experienced and reliable launch service provider. ULA has successfully delivered more than 125 satellites to orbit that aid meteorologists in tracking severe weather, unlock the mysteries of our solar system, provide critical capabilities for troops in the field and enable personal device-based GPS navigation. Good afternoon - everything is progressing toward the ULA Delta II ICESat-2 mission for NASA. The mission is set to lift off on a Delta II rocket on Saturday, Sept.15 from Space Launch Complex-2 at�Vandenberg Air Force Base in California.�The 40-minute launch window begins at 5:46 a.m. PT. PARIS, Sept. 10, 2018 – Global communications company, Viasat Inc., (Nasdaq: VSAT) announced today it selected United Launch Alliance's (ULA's) proven Atlas V vehicle to launch one of its ViaSat-3 satellite missions. This is the first commercial contract ULA has directly signed since assuming responsibility for the marketing and sales of the Atlas V launch vehicle from Lockheed Martin Commercial Launch Services earlier this year. The selection of Atlas V for one of the ViaSat-3 missions is the next step in implementing Viasat's integrated launch strategy which is designed to ensure the on-time launch of all of the ViaSat-3 spacecraft through launch vehicle diversity and an integrated approach to launch planning. Viasat will announce specific mission assignments for each of the contracted launch vehicles at a later date. "ULA continues to demonstrate schedule certainty and�flexibility, as well as be a trustworthy and reliable business partner. This coupled with unmatched Atlas V launch vehicle reliability and�tailored mission design capabilities made ULA a strong partner for a ViaSat-3 launch mission," said Dave Ryan, president, Space Systems at Viasat. "ULA is known for providing an innovative launch solution that is focused on mission success, which will allow us to meet our business objectives to bring high-speed, high-quality broadband connectivity to meet end-user demand." "ULA's Atlas V launch vehicle is the most reliable launch vehicle in the world and we could not be more pleased that Viasat, a leading satellite broadband innovator, has recognized the value the Atlas V can offer, and decided to select this rocket to launch its critical commercial communications satellite," said Tory Bruno, ULA's president and CEO. The�ViaSat-3 class of Ka-band satellites is expected to provide unprecedented capabilities in terms of service speed and flexibility for a satellite platform. The first two satellites will focus on the�Americas�and on�Europe,�Middle East�and�Africa�(EMEA), respectively, with the third satellite planned for the�APAC�region, completing�Viasat's�global service coverage. Each�ViaSat-3 class satellite is expected to deliver more than 1-Terabit�per second of network capacity, and to leverage high levels of flexibility to dynamically direct capacity to where customers are located. Atlas V has launched 78 missions with 100 percent success including 17 successful commercial missions. The workhorse rocket also delivered critical science missions for NASA such as Mars Science Lab, Pluto New Horizons and Mars InSight, and critical missions for the Department of Defense including Space-Based Infrared System (SBIRS) and Wideband Global SATCOM�(WGS). Viasat�is a global communications company that believes everyone and everything in the world can be connected. For more than 30 years,�Viasat�has helped shape how consumers, businesses, governments and militaries around the world communicate. Today, the Company is developing the ultimate global communications network to power high-quality, secure, affordable, fast connections to impact people's lives anywhere they are�on the ground, in the air or at sea. To learn more about�Viasat, visit:�www.viasat.com, go to�Viasat's�Corporate Blog, or follow the Company on social media at:�Facebook,�Instagram,�LinkedIn,�Twitter�or�YouTube. With more than a century of combined heritage, ULA is the world's most experienced and reliable launch service provider. ULA has successfully delivered 129 satellites to orbit that provide Earth observation capabilities, enable global communications, unlock the mysteries of our solar system, and support life-saving technology. This press release contains forward-looking statements that are subject to the safe harbors created under the Securities Act of 1933 and the Securities Exchange Act of 1934. Forward-looking statements include among others, statements about the relationship between Viasat and ULA; launch or in-orbit date; the ViaSat-3 class satellite for APAC, which has yet to be ordered; and the performance, capabilities and anticipated benefits of the�ViaSat-3 class satellite platform, expected capacity, service, speeds, coverage, flexibility and other features of the�ViaSat-3 constellation. Readers are cautioned that actual results could differ materially from those expressed in any forward-looking statements. Factors that could cause actual results to differ include: the ability to realize the anticipated benefits of the�ViaSat-3 satellite platform, unexpected expenses or delays related to the satellite system, the ability to successfully implement�Viasat's�business plan for broadband satellite services on�Viasat's�anticipated timeline or at all, including with respect to the�ViaSat-3 satellite platform; and risks associated with the construction, launch and operation of�ViaSat-3 and�Viasat's�other satellites, including the effect of any anomaly, operational failure or degradation in satellite performance. In addition, please refer to the risk factors contained in�Viasat's SEC�filings available at�www.sec.gov, including�Viasat's�most recent Annual Report on Form 10-K and Quarterly Reports on Form 10-Q. Readers are cautioned not to place undue reliance on any forward-looking statements, which speak only as of the date on which they are made.�Viasat�undertakes no obligation to update or revise any forward-looking statements for any reason. Copyright � 2018 Viasat, Inc. All rights reserved. All other product or company names mentioned are used for identification purposes only and may be trademarks of their respective owners.�Viasat�is a registered trademark of�Viasat, Inc.
Cape Canaveral Air Force Station, Fla., (Aug. 12, 2018) – A United Launch Alliance (ULA) Delta IV Heavy rocket carrying NASA's Parker Solar Probe spacecraft lifted off from Space Launch Complex-37 on Aug. 12 at 3:31 a.m. EDT. NASA selected ULA's Delta IV Heavy for its unique ability to deliver the necessary energy to begin the Parker Solar Probe's journey to the sun. The Delta IV Heavy is the nation's proven heavy lift launch vehicle, delivering high-priority missions for NASA, the U.S. Air Force and the National Reconnaissance Office. With its advanced cryogenic upper stage, Delta IV Heavy can deliver more than 14,000 pounds directly to geosynchronous orbit, as well as a wide variety of complex interplanetary trajectories. "The unique requirements of this mission made the Delta IV Heavy the perfect launch vehicle to deliver Parker Solar Probe into orbit with the highest precision," said Gary Wentz, ULA vice president of Government and Commercial Programs. "Congratulations to our team and mission partners, we are proud to launch this exceptional spacecraft that will provide invaluable scientific information benefiting all of humankind." This mission was launched aboard a Delta IV Heavy, which is comprised of three common core boosters each powered by an Aerojet Rocketdyne (AR) RS-68A liquid hydrogen/liquid oxygen engines producing a combined total of more than 2.1 million pounds of thrust. The second stage was powered by an AR RL10B-2 liquid hydrogen/liquid oxygen engine. Due to the extremely high energy required for this mission, the Delta IV Heavy's capability was enhanced by a powerful third stage provided by Northrop Grumman. This was the 37th launch of the Delta IV rocket, and the 10th in the Heavy configuration. It also marks ULA's sixth launch in 2018 and the 129th successful launch since the company was formed in December 2006. ULA's next launch is the ICESat-2 mission for NASA on what will be the final Delta II mission. The launch is scheduled for Sept.15 at Space Launch Complex-2 at Vandenberg Air Force Base, California. 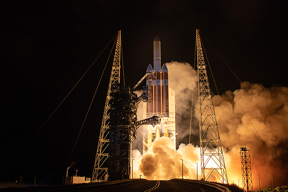 (Cape Canaveral Air Force Station, Fla., August 11, 2018) — The launch of a United Launch Alliance Delta IV Heavy carrying the Parker Solar Probe spacecraft was scrubbed today due to a violation of a launch limit, resulting in a hold. There was not enough time remaining in the window to recycle. Good evening - The ULA and NASA Launch Readiness Review was completed today and�everything is progressing toward the ULA Delta IV Heavy Parker Solar Probe mission for NASA. The mission is set to lift off on a Delta IV Heavy rocket on Saturday, Aug. 11 from Space Launch Complex-37 at Cape Canaveral Air Force Station in Florida. Today's forecast shows a 70 percent chance of favorable weather conditions for launch. The launch time is 3:33 a.m. ET. Good evening - everything is progressing toward the United Launch Alliance (ULA) Delta IV Heavy Parker Solar Probe mission for NASA. The mission is set to lift off on a Delta IV Heavy rocket on Saturday, Aug. 11 from Space Launch Complex-37 at Cape Canaveral Air Force Station in Florida. Today's forecast shows a 70 percent chance of favorable weather conditions for launch. The launch time is 3:33 a.m. ET. Good evening - everything is progressing toward the United Launch Alliance (ULA) Delta IV Heavy Parker Solar Probe mission for NASA. The mission is set to lift off on a Delta IV Heavy rocket on Saturday, Aug. 11 from Space Launch Complex-37 at Cape Canaveral Air Force Station in Florida. Today's forecast shows an 80 percent chance of favorable weather conditions for launch. The launch time is 3:33 a.m. ET. Live launch coverage will begin at 3 a.m. ET on Aug. 11. Cape Canaveral Air Force Station, Fla., (Aug. 7, 2018) – A United Launch Alliance (ULA) Delta IV Heavy rocket is in final preparations to launch NASA's Parker Solar Probe from Space Launch Complex-37 on Aug. 11. 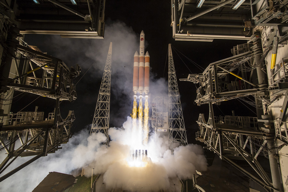 NASA selected ULA's Delta IV Heavy for its unique ability to deliver the necessary energy to begin the Parker Solar Probe's journey to the sun. After launch, the spacecraft will orbit directly through the solar atmosphere – the corona – closer to the surface than any human-made object has ever gone. "ULA is honored to launch the one-of-a-kind Parker Solar Probe," said Tory Bruno, ULA president and CEO. "Only the Delta IV Heavy possesses the capability to deliver this unique mission to orbit, and we are proud to provide unmatched launch services to our NASA mission partners." The Delta IV Heavy is the nation's proven heavy lifter, delivering high-priority missions for the U.S. Air Force, National Reconnaissance Office and NASA. With its advanced upper stage, Delta IV Heavy can take more than 14,500 pounds directly to geosynchronous orbit, as well as a wide variety of complex interplanetary trajectories. This Delta IV Heavy is comprised of three common core boosters each powered by an Aerojet Rocketdyne (AR) RS-68A liquid hydrogen/liquid oxygen engine, producing a combined total of more than 2.1 million pounds of thrust. The second stage is powered by an AR RL10B-2 liquid hydrogen/liquid oxygen engine. Due to the extremely high energy required for this mission, the Delta IV Heavy's capability will be augmented by a powerful third stage provided by Northrop Grumman. 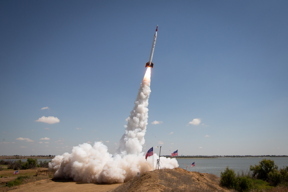 Centennial and Boulder, Colorado (July 17, 2018) — More than 30 student-built payloads launched onboard an intern-built sport rocket United Launch Alliance (ULA) and Ball Aerospace once again collaborated on a hands-on science, technology, engineering and math (STEM) education program with a rocket launch over southeastern Colorado. The 10th anniversary launch marked the high point of an experience designed to simulate a real-life launch campaign and inspire students from kindergarten to graduate school to pursue careers in STEM. "I've been building rockets since I was a kid, and it was incredibly influential to my choice to go into aerospace as a career," said Tory Bruno, ULA CEO and president. "This partnership with ULA and Ball lets students at all levels a chance to see what it's like to design, build, test and learn from that process – with the added motivation that their work launches on a rocket." In honor of the 10th anniversary event, ULA introduced a twist – a payload competition for K-12 teams. Eleven teams competed to win up to $5,000 by designing a craft to return the payload to a pre-appointed location near the launch site. The payloads were too widely dispersed to measure distance accurately, so team scores on pre-launch design reviews determined the winners. Second place: $3,000: Monarch High School (Lafayette, Colorado), for "Droney McDroneface"
Third place: $1,500: Green Mountain High School (Lakewood, Colorado), for "The Gassy Can"
For more information on ULA, visit the ULA website at�www.ulalaunch.com. Join the conversation at www.facebook.com/ulalaunch,�twitter.com/ulalaunch, and�instagram.com/ulalaunch. "We are pleased that the IAM represented employees have ratified this agreement that is so critical to continuing ULA's success," said Tory Bruno, ULA president and CEO. "The represented employees' contributions have propelled ULA forward in delivering critical capabilities for our nation and our customers. Our employees build the best, most reliable rockets flying today and the missions we launch save lives, explore the universe, connect the world and help humankind unlock its potential in space. � Centennial, Colo., May 11, 2018 – United Launch Alliance (ULA) today announced Aerojet Rocketdyne as a strategic partner for the RL10 upper stage engine for ULA's next-generation Vulcan Centaur rocket following a competitive procurement process. ULA Atlas V rocket carrying the InSight mission for NASA. Vandenberg Air Force Base, Calif., (May 5, 2018) – A United Launch Alliance (ULA) Atlas V rocket carrying NASA's InSight Mars lander lifted off from Space Launch Complex-3 on May 5 at 4:05 a.m. PDT. InSight is the first mission launched to another planet from the West Coast, which requires more energy than an East Coast launch that takes advantage of the Earth's rotation. The West Coast Mars launch was made possible by the performance of the Atlas V and an optimized trajectory design to achieve the very exact hyperbolic injection required to deliver the spacecraft to Mars. ULA and its heritage rockets have launched every U.S. spacecraft to the Red Planet since the 1960s, including Mars Science Lab, as well as the Spirit and Opportunity rovers. This was the 10th Mars launch on an Atlas rocket, and the fourth by the Atlas V following the Mars Reconnaissance Orbiter in 2005, the Curiosity rover in 2011 and the MAVEN orbiter in 2013. 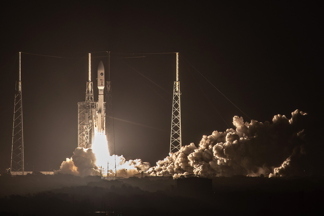 In addition to InSight, the mission included two CubeSats which launched from dispensers mounted on the aft bulkhead carrier on the Atlas V Centaur second stage. The Mars Cube One (MarCO) CubeSats, designed and built by the Jet Propulsion Laboratory, are the first to travel interplanetary. "ULA is proud to have been a key part of this mission to explore our universe and unlock possibilities in space that will benefit all of humankind," said Gary Wentz, ULA vice president of Government and Commercial Programs. "I want to express my sincerest thanks to the entire ULA team, NASA and all our partners and suppliers for their exceptional teamwork and dedication to another successful mission." 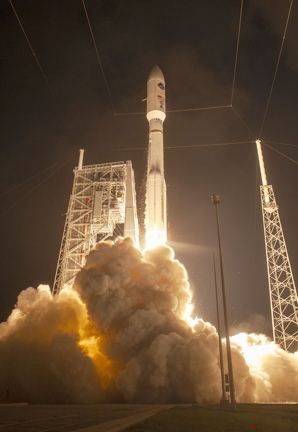 This mission was launched aboard an Atlas V 401 configuration vehicle, which includes a 4-meter Payload Fairing (PLF). The Atlas booster for this mission was powered by the RD AMROSS RD-180 engine. Aerojet Rocketdyne provided the RL10C-1 engine for the Centaur upper stage. This is the 78th launch of the Atlas V rocket, ULA's fifth launch in 2018 and the 128th successful launch since the company was formed in December 2006. ULA's next launch is the Parker Solar Probe mission for NASA on a Delta IV Heavy rocket. The launch is scheduled for no earlier than July 31 at Space Launch Complex-37 at Cape Canaveral Air Force Station, Florida. With more than a century of combined heritage, United Launch Alliance is the Nation's most experienced and reliable launch service provider. ULA has successfully delivered more than 125 satellites to orbit that aid meteorologists in tracking severe weather, unlock the mysteries of our solar system, provide critical capabilities for troops in the field and enable personal device-based GPS navigation. Good evening - Everything is progressing toward the ULA Atlas V InSight mission for NASA. The mission is set to lift off on an Atlas V rocket on Saturday, May 5 from Space Launch Complex-3 at Vandenberg Air Force Base in California. Today's L-1 forecast shows a 20 percent chance of favorable weather conditions for launch. The two-hour launch window begins at 4:05 a.m. PT. Live launch coverage will begin at 3:30 a.m. PT on May 5. Good evening -- The ULA and NASA Launch Readiness Review was completed today and�everything is progressing toward the ULA Atlas V InSight mission for NASA. The mission is set to lift off on an Atlas V rocket on Saturday, May 5 from Space Launch Complex-3 at Vandenberg Air Force Base in California. Today's L-2 forecast shows a 20 percent chance of favorable weather conditions for launch. The two-hour launch window begins at 4:05 a.m. PT. Good evening - everything is progressing toward the ULA Atlas V InSight mission for NASA. The mission is set to lift off on an Atlas V rocket on Saturday, May 5 from Space Launch Complex-3 at Vandenberg Air Force Base in California. Today's L-3 forecast shows a 20 percent chance of favorable weather conditions for launch.� The two-hour launch window begins at 4:05 a.m. PT. A ULA Atlas V rocket carrying the AFSPC-11 mission for the U.S. Air Force lifts off from Space Launch Complex-41 at 7:13 p.m. ET on April 14. Cape Canaveral Air Force Station, Fla., (April 15, 2018) – A United Launch Alliance (ULA) Atlas V rocket carrying the Air Force Space Command (AFSPC)-11 mission lifted off from Space Launch Complex-41 on April 14 at 7:13 p.m. EDT. AFSPC-11 is a multi-payload mission. The forward payload is referred to as CBAS (Continuous Broadcast Augmenting SATCOM) and the aft spacecraft is EAGLE (EELV Secondary Payload Adapter (ESPA) Augmented Geosynchronous Experiment). "Today's launch is a testament to why the ULA team continually serves as our nation's most reliable and successful launch provider for our nation's most critical space assets," said Gary Wentz, ULA vice president of Government and Commercial Programs. "I want to thank the entire ULA team, and the phenomenal teamwork of our mission partners." This mission was launched aboard an Atlas V Evolved Expendable Launch Vehicle (EELV) 551 configuration vehicle, which includes a 5-meter large Payload Fairing (PLF). The Atlas booster for this mission was powered by the RD AMROSS RD-180 engine. Aerojet Rocketdyne provided the five AJ-60A solid rocket boosters (SRBs) and RL10C-1 engine for the Centaur upper stage. This is the 77th launch of the Atlas V rocket, ULA's 4th launch in 2018 and the 127th successful launch since the company was formed in December 2006. 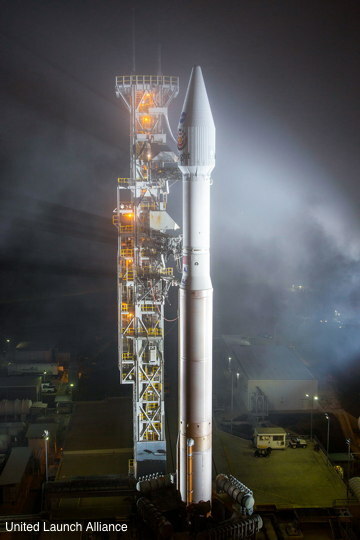 ULA's next launch is the InSight mission for NASA on an Atlas V rocket. The launch is scheduled for May 5 at Space Launch Complex-3 at Vandenberg Air Force Base, California. Good afternoon — Everything is progressing toward the ULA Atlas V launch carrying the Air Force Space Command (AFSPC)-11 mission. 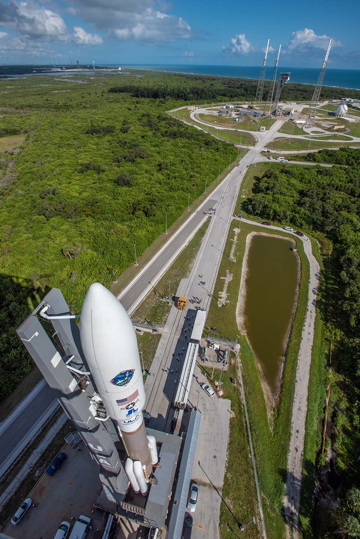 The mission is set to lift off on Saturday, April 14 from Space Launch Complex-41 at Cape Canaveral Air Force Station in Florida. Today's L-1 forecast�shows an 80 percent�chance of favorable weather conditions for launch. The launch time is 7:13 p.m. ET. BARS + TONE – 6:22 P.M. PROGRAM START – 6:53 P.M.
(Cape Canaveral Air Force Station, Fla., April 13, 2018) A ULA Atlas V rocket carrying the Air Force Space Command (AFSPC)-11 mission is rolled from the Vertical Integration Facility to the launch pad at Cape Canaveral's Space Launch Complex-41. Mission Description: Air Force Space Command (AFSPC)-11 is a multi-manifested mission. The forward spacecraft is referred to as CBAS (Continuous Broadcast Augmenting SATCOM) and the aft spacecraft is EAGLE (ESPA Augmented GEO Laboratory Experiment). Launch Notes: AFSPC-11 will mark the 77th launch of the Atlas V rocket since its inaugural launch in 2002 and the eighth in the 551 configuration, which produces more than 2.5 million pounds of thrust off the launch pad. 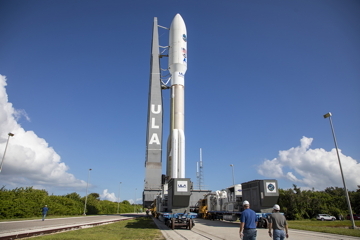 This mission will be ULA's 127th since the company was founded in December 2006. Launch Updates: To keep up to speed with updates to the launch countdown, dial the ULA launch hotline at 1-877-852-4321 or join the conversation at www.facebook.com/ulalaunch, twitter.com/ulalaunch and instagram.com/ulalaunch; hashtag #AtlasV. Go Atlas! Go Centaur! Go AFSPC-11!